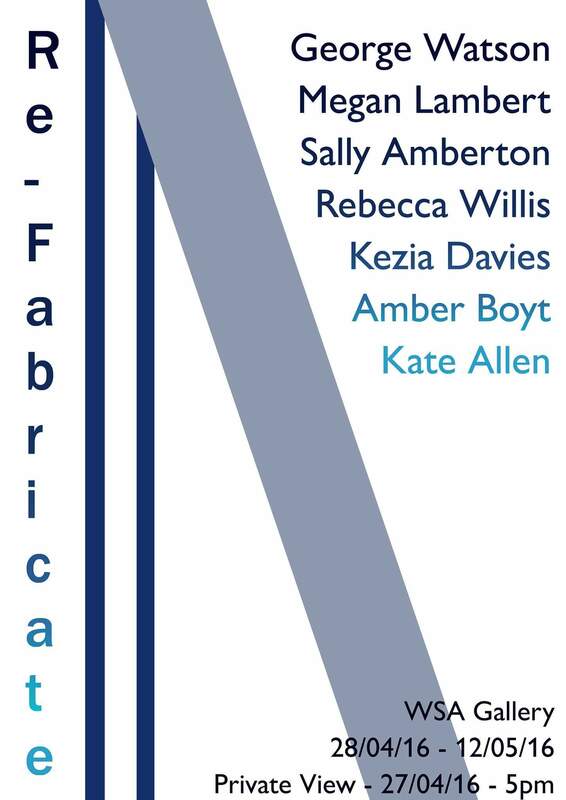 This is the last week to catch Refabricate, the current exhibition in the WSA Gallery exploring the relationships between textiles and art and featuring the work of Printed Textile student Sally Amberton. Her involvment in the show came about from conversations at the cross-disciplinary ‘Hookers Knitters and Stitchers’ Society of which Sally is president. 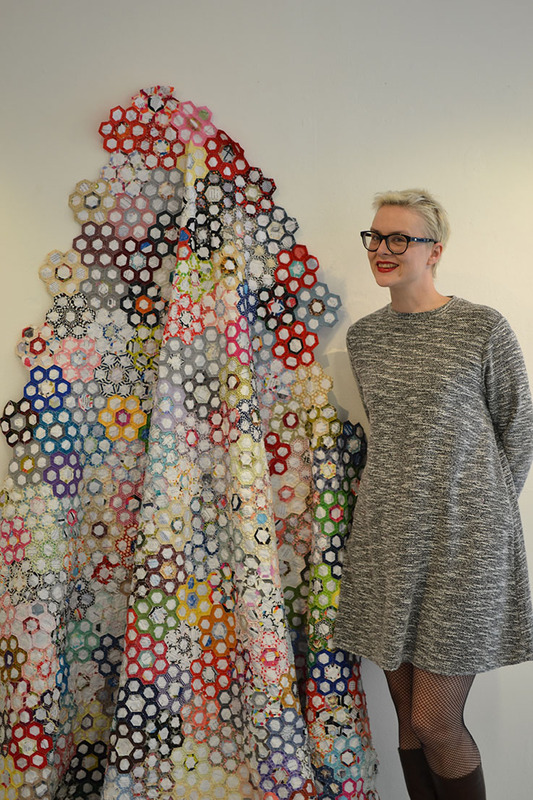 Her contribution to the show includes two hand embroidered portraits and a hexagon patchwork quilt top made of cotton and paper, using the English Paper Piecing technique. Here Sally tells us a bit more about her quilt piece. “Nowadays quilt enthusiasts and historians learn about women’s lives by finding and investigating papers within historic quilts. Quilt makers would use scraps of paper from newspapers of the day but also any other paper could be used this way. Shopping lists, notebooks and other pieces of paper captured in quilts now provide valuable insight into women’s history. By showing the underside of a quilt top makes the fragments of paper used to piece the patchwork visable and happens to tell a story of my life too. The underside of this patchwork reveals fragments of documents from conferences and events I organised working at the University of Oxford, pieces of hand-outs and Power Point presentations on Climate Change, I created with Sir David King, diary fragments, examples of my handwriting, documents of my application to University and process photos and designs created whilst studying at Art School are all in the mix. What might look like the boring side actually quietly places me in history and tells the story of my life. The show is on until 12.05.2016 and open daily. 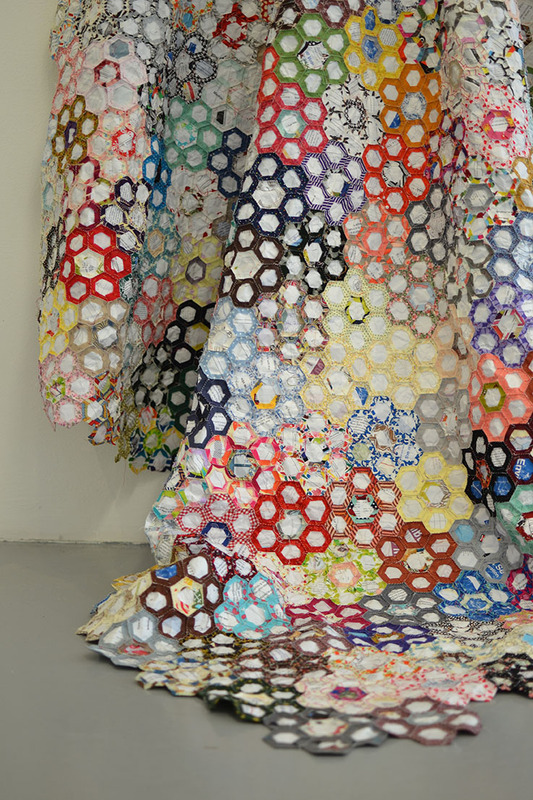 This entry was posted in Textiles and tagged Artists, Exhibition, Refabricate, Textiles, Winchester School of Art, WSA Gallery by Caitlin Hinshelwood. Bookmark the permalink.